* Nano-particles: where is the safety research? Nano-technology has been called the most important technology of the 21 st century. Already, there are strong marketing efforts to sell nano-cosmetics, even though the safety has not been verified. When Tokyo Governor Shintaro Ishihara was showing black particles from diesel exhaust collected in a bottle at a famous press conference, he was fed up with the slow actions of Japan 's national government. From October, 2003, all old diesel trucks were prohibited in Tokyo . Now, there is concern about nano-size particles in diesel fumes that are not visible to the naked eye. Japan Offspring Fund has revealed that margarines contain high levels of trans-fatty acids. The three most common brands on the Japanese market all have high levels of these artery-clogging substances, but one manufacturer has been able to reduce the amount. Nano-particles: where is the safety research? 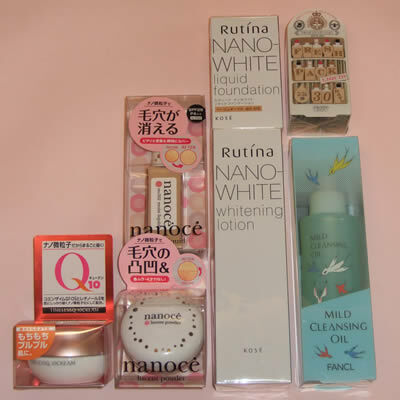 Some cosmetic products are marketed with advertising claims that include the word “nano”. For example, we found ad copy stating that the “nano-particles” in a cream make a thin layer, so the cream covers the skin better, and becomes one with the skin. Another product promised that pores would be completely cleansed by the nano-particles. Yet another cream was using the word “nano-tech”, claiming that it would give the skin a transparent impression. The idea that tiny particles of the ingredients in cosmetic products would have some kind of special, wonderful effect started to appear in the latter half of the 1980s. Brand names or product names began to use the word “nano”. Especially many foundation creams and sunburn protection lotions, as well as cleansing foam and shampoos are sold using the concept of “nano”. We even found one hair-growth treatment cream using this word. In a survey by the Japan Cosmetics Industry Association in February 2005, a quarter of the association's 122 member companies replied that they use “nano-particles” in some of their products. There are also examples of “nano-health food” for substances like coenzyme Q10. What is nano-technology? Scientists in advanced nations around the world are competing to try to develop extremely tiny particles at the molecular level. One nanometer is one-millionth of a millimeter. This is called the “nano-unit” level, but recently, concerns about safety have begun to appear. The Mainichi Shimbun had a front page article about safety studies on nano-particles on September 20, 2005 . On September 22, there was news about nano-particles in diesel exhaust and the effect on pregnant mothers and the fetus, especially the risks related to brain development. In fact, there has been international concern about this issue for several years. Prince Charles voiced his concerns in an article in a British newspaper, and the Royal Society has studied the risks. Their advice is that a precautionary approach is needed. ETC Group, the Canadian environmental organization, has criticized nanotechnology, and there is data to back up the critics' concerns. In one experiment, Dr. Eva Oberdorster of Southern Methodist University in Dallas , U.S. , showed that fish exposed to nano-particles had up to a 17-fold increase in brain damage compared to unexposed animals. Another study showed that nano-tubes can damage lung tissue of mice if inhaled. Because nano-particles are so small, they easily pass through the cell membranes of human skin. It is said that with safe substances, there cannot be any danger. However, researchers have developed a synthetic “nano-carrier” that is claimed to “encapsulate and transport” vitamin E deeper into the skin. Thus “nano-lotions” have been developed that could cause problems. As the diameter of the water molecule is 0.3 nanometers, and if the size of the encapsulated vitamin E really is 1 nanometer (more than 3 times as large as the water molecule), the vitamin E could reach places in the body where it really should not enter. This could lead to serious side effects. In Japan there has only been research into how to use nano-technology, and few people have raised any concerns about the safety. The government's research institutes and several universities are also active in this field. Newspapers have reported that safety data would begin to be collected from October, 2005, but in other advanced countries such as the U.S. , approx. 4 percent of the research budget in the area of nano-technology is going into safety studies. It is a clear imbalance that in the field of cosmetics and certain health foods, nano-technology was already introduced by Japanese companies, before they had thought of gathering safety data. Perhaps in the future there will be some use for this technology, but for now, we think it is better to avoid using such products. When Tokyo Governor Shintaro Ishihara was showing black particles from diesel exhaust collected in a bottle at a famous press conference, he was fed up with the slow actions of Japan 's national government. From October, 2003, all old diesel trucks were prohibited in Tokyo , as well as in the nearby prefectures of Chiba , Saitama and Kanagawa. This unique legislation is part of the “Say No to Diesel Vehicles” campaign. The industry opposed this move, but the air in the entire Kanto region has in fact become remarkably clean. Strict emission controls were also implemented from 2005, but problems remain with the rules. As for the black particles that even Governor Ishihara could see in the bottle, they are all rather large in size. Now, there is concern about nano-size particles that are not visible to the naked eye. Exhaust particles float in the air after being emitted from the vehicles. The size of such sooth particles can be smaller than 3 micrometers. These are mainly emitted from diesel engines, and not from regular cars. However, included in the diesel exhaust fumes are also tiny nano-particles. These are “super-small” particles that have recently been shown to cause damage to the mouse fetus. The reason this is worrying is that the nano-particles are able to move from the female rat that was exposed to diesel fumes, to its fetus, and cause abnormalities in its offspring. According to a remarkable study by Dr. Ken Takeda at Tokyo University of Science, and his team, diesel exhaust contains various nano-sized particles that act as endocrine disruptors. Their study indicated the possibility that prenatal exposure to diesel fumes may affect the development process of rat's brains, even after birth. The serious damage due to this content of diesel fumes had not previously been known. The study also suggested the possibility that diesel fumes may affect the formation of male reproductive organs. In the study by the Takeda Team, the testis (gonads) of the male rats born from mothers that had breathed diesel fumes had decreased weight, compared to the testis of male rats born from mothers that had not breathed diesel fumes. Mature male rats exposed to diesel particles during the fetal period also showed an irreversible decrease in daily sperm production. Another effect was that such rats were very active even in the early morning, which is abnormal behaviour. Furthermore, abnormal hormones were found in the brains of the rats. Among the harmful effects of diesel fumes, the fact is that some particles could influence the genes that trigger hormone production. This is really epoch-making research, with huge consequences. Particles contained in diesel vehicle emissions is known to be carcinogenic and also connected to pollen allergies and respiratory system disorders, but the discovery that nano-particles can have an endocrine disrupting effect is alarming. It is clear that stricter rules for air quality to further limit exposure to harmful nano-particles are urgently needed. At the same time, Daiichi Mamoru Kai sold margarine with high levels of trans-fatty acids, but after realizing that this was a health problem, they were able to reduce the amount to only 0.43 g /100 g.